I'm an aficionado of vinyl 7" records, not only because of the music but also because many of these records have an outspoken label design. In my previous entry I showed a selection of labels from my own collection which were all related to some sort of animal. In this entry I will introduce some more animal-themed labels. Metro-Goldwyn-Mayer is a well-known film studio. The studio's mascot is a real-life lion, which features in MGM's production logo. In fact there were seven different lions between 1917 and the present which played their part in this logo (Slats, Jackie, Telly, Coffee, Tanner, George and Leo). 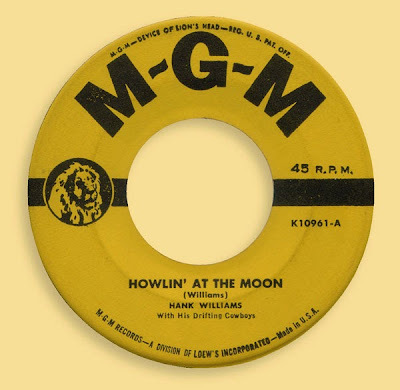 MGM Records was launched in 1946 by the film studio for the purpose of releasing soundtrack albums, but soon started to release other musical genres. 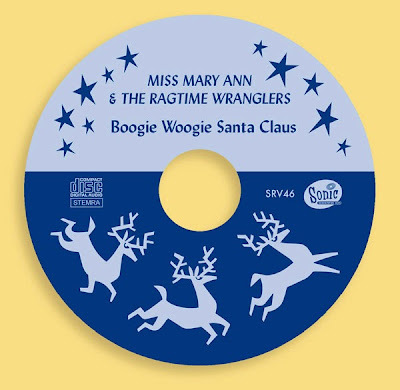 The logo of the record company features a drawn version of the studio's mascot. The yellow label with black print, like the one right below, was in use up till 1959. I don't know if you'll agree with me, but I find this label passable, however not spectacular. How much more fun is the 'special disc jockey record', with an alternative version of the logo in comic style! 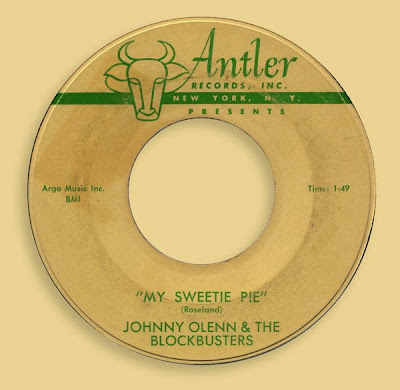 Antler Records was a small label founded in 1956 by Buck Ram, a vocal coach, music publisher arranger and probably most remembered for composing the million selling hits Only You and The Great Pretender for the Platters. I quite like the logo of this label, a beautiful stylized bull's head. I'm a bit puzzled though. An antler might be associated with a deer, a moose or a reindeer, but surely not with a horned bull. 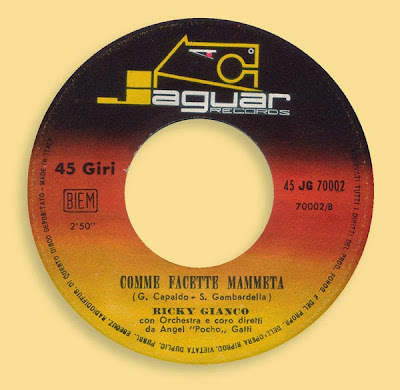 Another stylized logo can be found on the label of Jaguar, an Italian record company that started in Milan in 1963. The label was designed by Mario Moletti, who also designed the label of another Italian record company, Clan Celentano, founded by singer and actor Adriano Celentano. I don't know if it was the artist's intention to make the jaguar's head a bit reminiscent of Pre-Columbian art, but it's certainly a bonus! I don't know quite how to interpret the dachshund on the label of End Records (founded 1957). Is it a dachshund cut in half with it's rear put in front? Or is it a very long dachshund that walks around the label, almost catching up with it's own tail? On the other hand, it could just as well be two dogs instead of one. 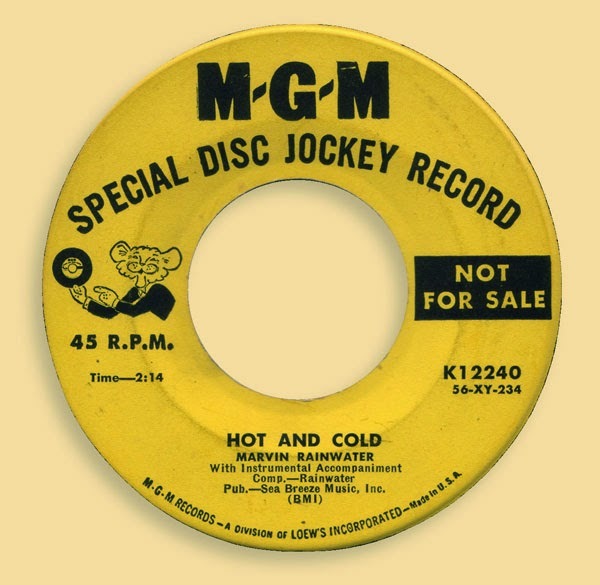 The label as shown was in use between 1959 and 1963. 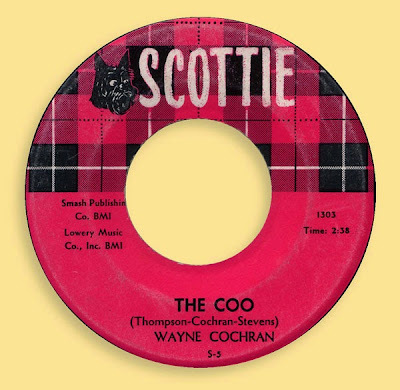 It seems that the record label Scottie - based in Atlanta, Georgia - had a very short lifespan. The discography of this record company only mentions releases from 1959 to 1960. For obvious reasons the label depicts a Scottish Terrier. The tartan is also quite self-evident. I don't mind that at all. I confess, I'm a sucker for tartans! Of all the dogs that ever appeared on a record label, Nipper must be the most famous one. You probably already know the story of Nipper, but that doesn't withhold me from writing it down again. Nipper (1884-1895) was a terrier owned by Mark Henry Barraud who lived in Bristol, England. When Mr. Barraud died in 1887, his brother Francis, a painter, took care of Nipper. Francis also inherited a phonograph and a number of cylinders with the recorded voice of Nipper's former owner. Francis noted the peculiar interest the dog took in the recorded voice of his late master. Looking into the trumpet of the phonograph with his head cocked slightly, it was as if Nipper was trying to figure out how his master was speaking to him from this strange device. Caught by this image, Francis took up the idea to make a painting of this scene. Francis tried to sell this painting to the Edison-Bell Company, but they weren't interested. However, the Gramophone Company was, provided that Francis would change the phonograph into a gramophone (which played 78 rpm records instead of cylinders). The Gramophone Company started to use the image of the painting on their company's catalogue in 1899. It was only by 1909 that Nipper appeared on the label of their gramophone records. By then the Gramophone Company had also adopted the name His Master's Voice, which was the name the image of the listening dog was known by. However, Nipper's debut on a record label was in 1902, when the Victor Talking Machine Company acquired the rights for the United States to use him as a trade mark. In 1929 the Radio Corporation of America bought the controlling rights of Victor, after which the company became known as RCA Victor. If you have ever asked yourself "How come Nipper features on both the British His Master's Voice and the American RCA Victor record labels?"...... well, now you know! 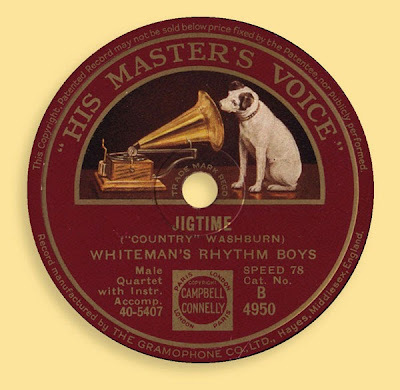 Up till now I've only shown 45 rpm record labels, but if one wants to do justice to Nipper's image on a record label, the 78 rpm version of His Master's Voice is the most preferable. I happen to have a few 78 rpm records, so I can show you Nipper at his second best (the best being the original painting of course). 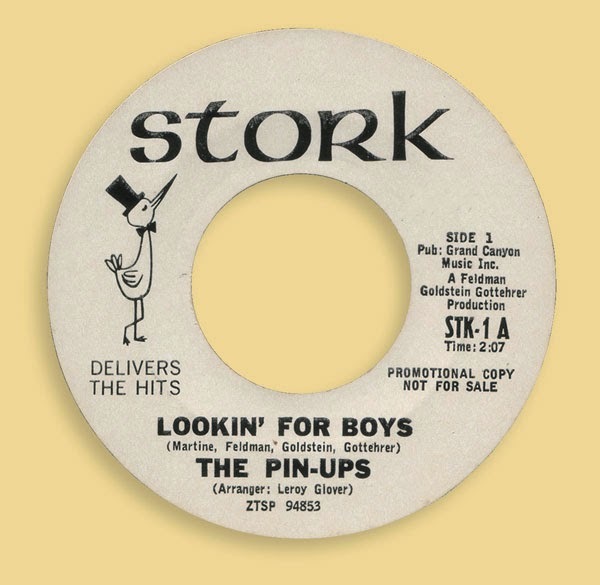 Another reason why I wanted to show you the 78 rpm record label, is because I once made a pastiche of this label. I made this label for a band called The Sound of Music, in which I played drums. The band had no connection at all with the world-famous musical, except for the name (which the band believed was in essence a very suitable name for a band). Nevertheless I couldn't resist the temptation to make some references to this musical, just for the fun of it. There's no particular reason why I made a reference to the label of His Master's Voice. It's just very tempting to make a little jest on such an iconic image. In 2003 I made a label for a demo CD at the request of a friend of mine who plays in a band called Gersch. 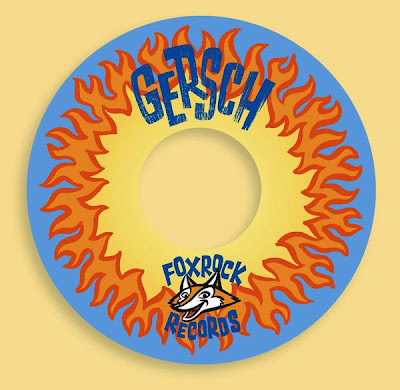 I was quite pleased to learn he named his fictitious record label Foxrock Records, which gave me the opportunity to depict an animal in the logo. I love to draw animals! Miss Mary Ann & The Ragtime Wranglers released a Christmas single CD in 2007 for which I made this label. The three reindeers may look identical on first sight, but if you take a closer look you'll notice that they all differ a little bit. No one can accuse me of being a lazy artist! It's possible you're a bit disappointed that I've also displayed labels of my own design in this entry, which are a bit in discord with those beautiful record labels of yesteryear. They're even CD labels, for crying out loud! 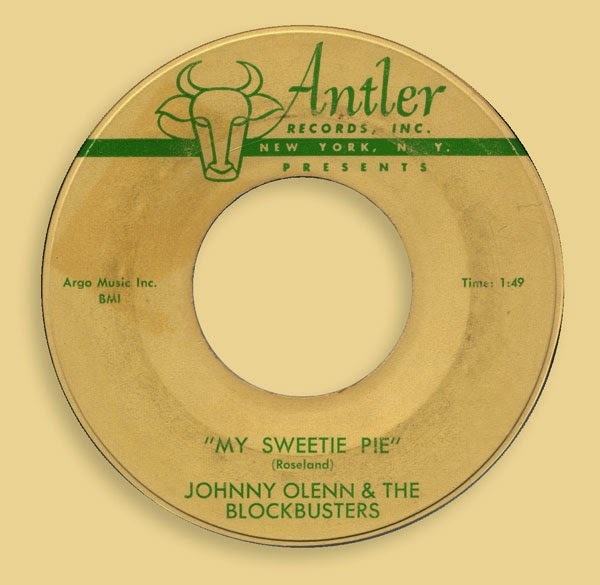 Why didn't I restrict myself to labelshots of 7" records from the 1950s and 1960s? Well... besides wanting to share my enthusiasm with you for the beauty and witticism of the design of those record labels, I also wanted to show you that they were an inspiration for my own work. From that point of view, it makes sense to add a number of labels of my own design to this entry. So be prepared, dear reader, for you may have to endure some more labels I've made in upcoming entries! Many years ago, in 1997 to be precise, Frits Jonker asked me to make an illustration for the cover of a little booklet he had made. It was a booklet about labels of 7" records. 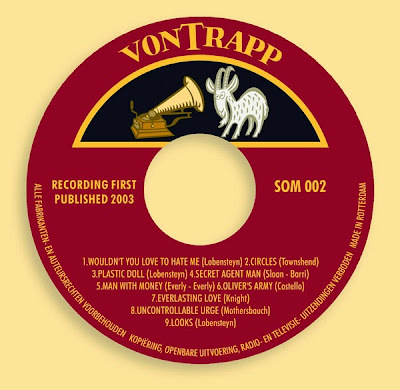 Frits had made a request to several befriended collectors of these records to send him pictures of labels that in one way or another would fire one's imagination. With these images he compiled this booklet and named it Labelshots. Before this booklet, I had never heard of the phrase 'labelshots' before. To this day, I even don't know if it's a real word in the English language. Maybe it's not, but it covers the topic of this xeroxed booklet very well! 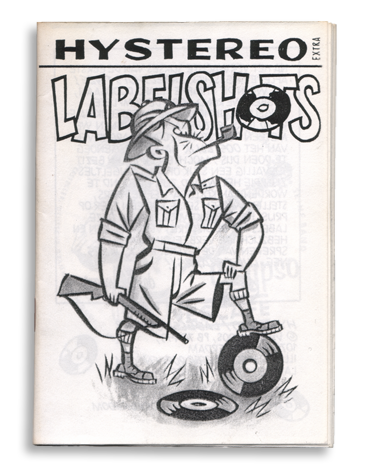 Searching for a suitable image for the cover of Labelshots, I came up with this idea of a hunter who had just shot some records. Not for their fur coat or their antlers, as it's often the case with game, but for their labels. Although I also made a contribition to Labelshots at that time, I didn't have as much 45s as I do now. 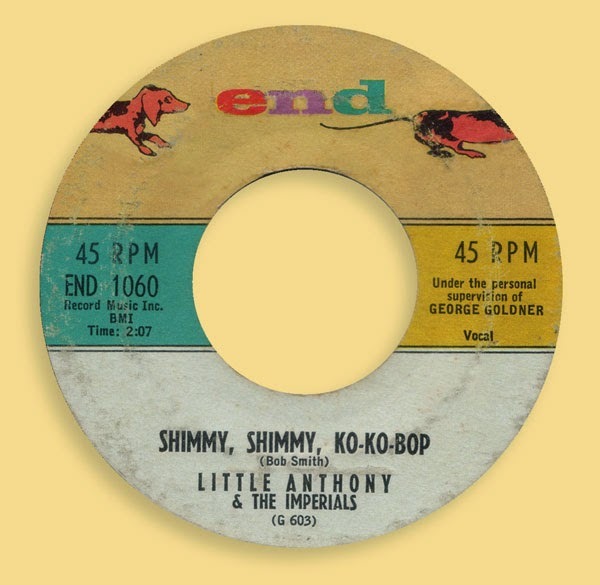 Therefore my choice in remarkable labels on 7" records from my collection was rather limited. However, Frits' booklet stimulated me to pay more attention to the labels of 45s and as I gathered more and more vinyl singles over the years I became even more aware of the very decorative and beautiful graphic design of these labels, especially the ones that were pressed in the USA. In this entry I would like to show some of those labels with the topic 'animals'. They're all from my own collection and I don't own every record that has been released which features an animal on its label, as you will understand. Subsequently, this selection is far from complete. It's only meant to give you an impression. Besides that, please keep in mind that this entry is not about the music on these records. It's strictly about the graphic design of the labels. Red Bird is a label founded in 1964 by songwriters Jerry Leiber and Mike Stoller and is probably one of the better known record labels which has an animal as a trademark character. 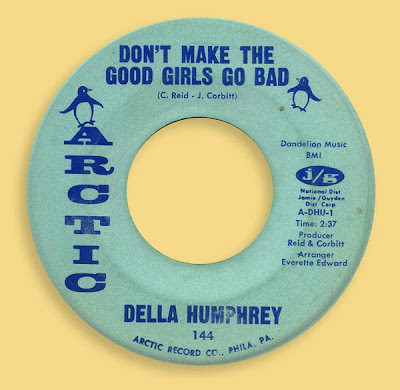 Another label that was founded in 1964 was Arctic, based in Philidelphia. The label features - not unsurprisingly - two penguins. 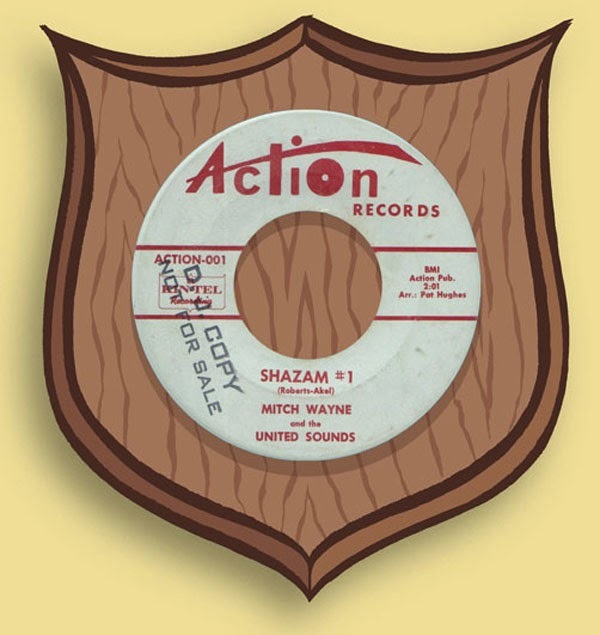 In days now gone the United States knew many small record labels which focused on a local market. Many of these record labels have now gone into oblivion, so it's not that easy to find any information about these small labels. One of such labels was Stork. 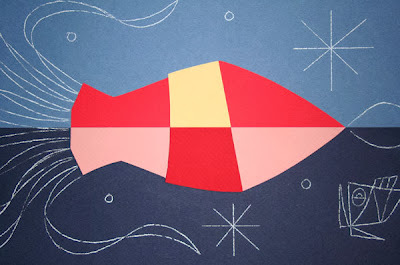 It was probably founded in Neptune, New Jersey - again in 1964. 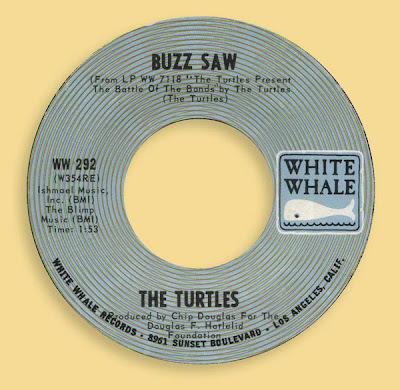 It was not uncommon to release a promotional or an advance copy with a custom label, quite often a black and white version of the official coloured label (see image below). The copies of Stork 45s released for the consumers market came with a pink label with blue print. The trademark character in cartoon style looks rather sophisticated with his top hat and bow tie, wouldn't you agree? Parrot Records was a division of the American record label London (not to be confused with the British record company of the same name). 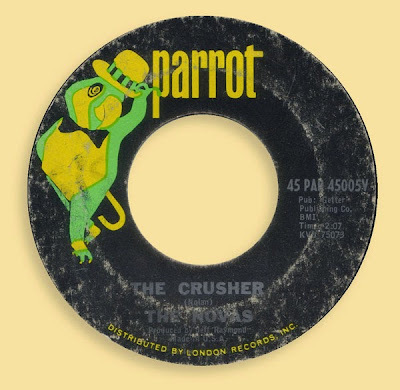 Parrot usually licensed recordings made by Decca, England (not to be confused with the American record company of the same name), but additionally also released recordings made by American bands. 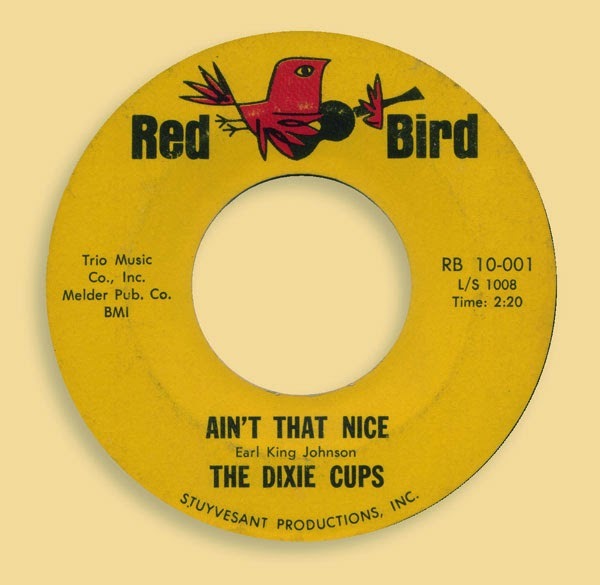 The theme of the dressed up bird as a trademark character pops up again on this label. The parrot even outbids the stork by adding a walking cane and spats to his outfit! 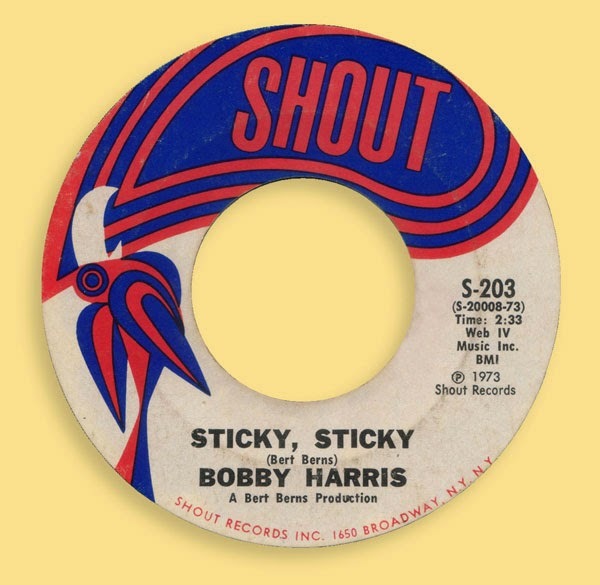 Shout was a New York-based label subsidiary of Bang Records that existed from 1966 to 1974. This label also features a parrot. Or it might be a toucan, I'm not quite sure about that. 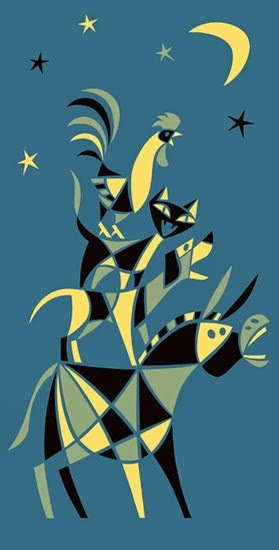 It doesn't matter really, it's still a beautiful stylised and very decorative graphic design. The fish symbols on the label of the Seattle-based Dolton Records may not seem to have any connection with the company name. 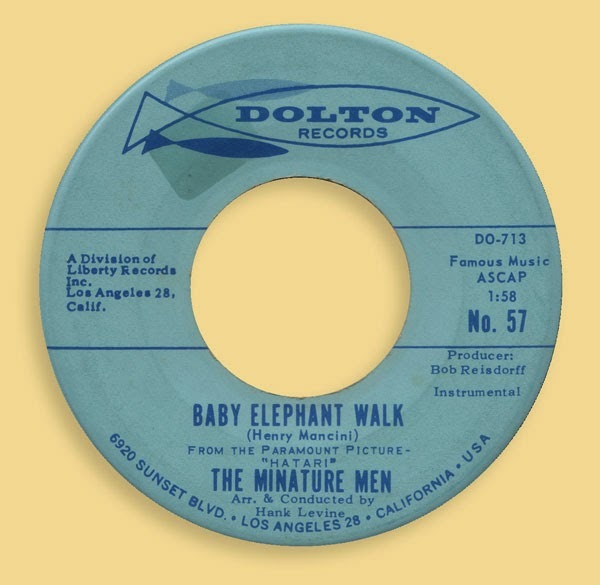 However, knowing that the record label was originally called Dolphin Records makes the connection way more obvious. Nevertheless - as graceful as the design of fish logo is - it's a bit unsatisfactory that the fish symbols don't resemble in any way the silhouette of a dolphin (the sea mammal) or even the dolphin fish (aka Mahi-Mahi or Dorado fish). You might call me a nitpicker and you're probably right too. 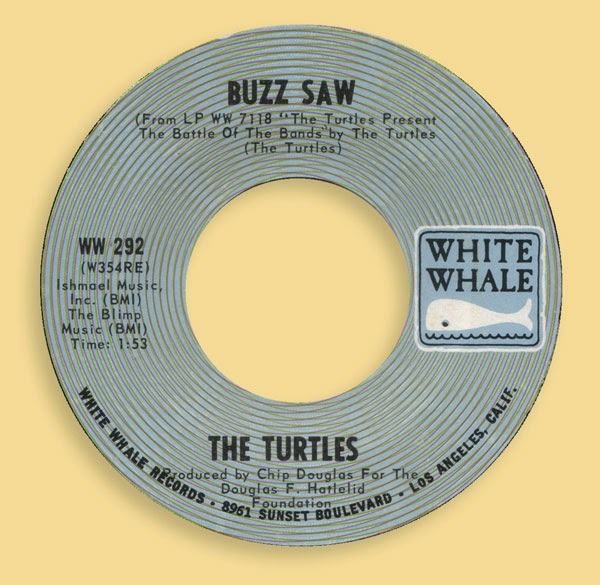 There's no such indistinctness concerning White Whale Records - founded in Los Angeles in 1965 - and its logo. The logo looks a bit naïve, but I find it quite charming. Phil-L.A. of Soul Records, which started in 1967, was a subsidiary label of Jamie Records. 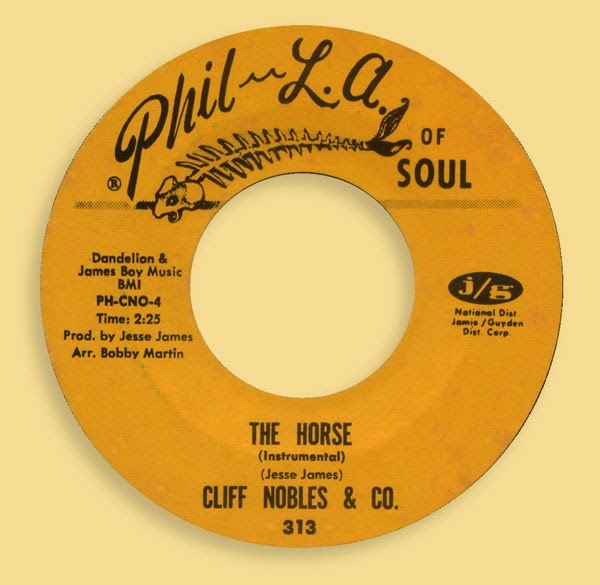 The logo of Phil-L.A. of Soul Records is a bit puzzling. I would love to learn the story how this label came up with the idea to choose a fish bone as their trademark. Maybe some reader of this blog knows this story and hopefully would like to share it. The last label of this entry is by Crab Records. 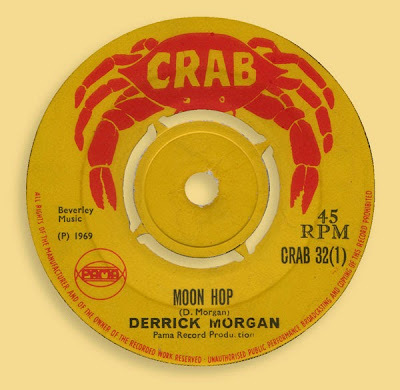 Crab Records was a reggae label that issued releases from 1968 to 1971. It was a subsidiary of Pama, one of the mayor labels for reggae music in the United Kingdom. Next time I'll show you more animal related labels. Until then! Here's a picture of the work in progress for these prints. Just to give you an idea what kind of materials I use making these images. It's not all digital work, you know! I also use a lot of documentation, which this picture clearly shows. Those who have read my previous entry about making a paper collage of a giant squid and quite liked the stylised image of this creature of the deep sea, might be pleased to learn that it's now available as a print. I've made a picture of the framed print in a homelike setting, so you can get a better idea of the actual size of the print. This picture might also make it a bit easier for you to visualize the print on your own wall, in a slightly different setting of course. In my shop you'll find also other prints for sale. 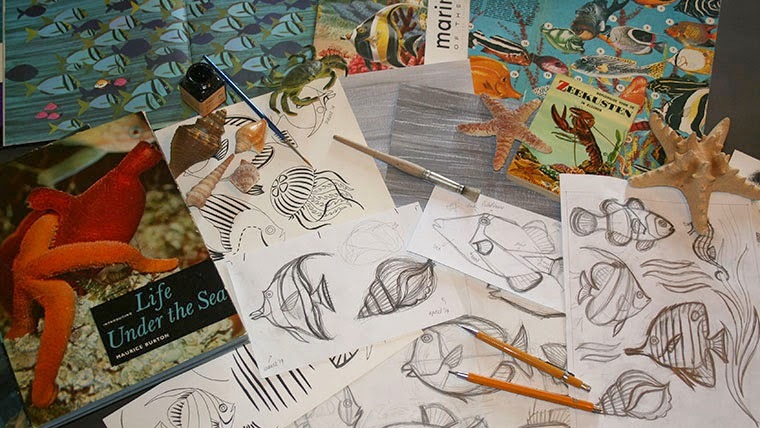 The examples given in this entry are more or less coincidentally marine life-themed. It's a fascination I've had ever since my childhood years. I can well imagine that you don't share this fascination. Rest assured, I also have other interests. 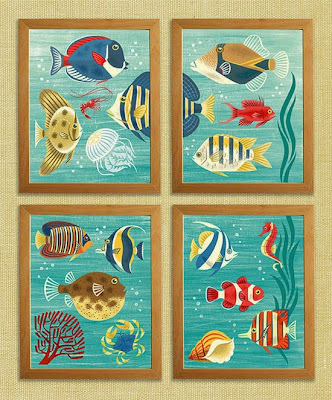 Not every print in my shop depicts fish and other creatures of the sea. Please keep in mind I've only just started my webshop. The supply this moment is not as various as I would like it to be, but more items will be added frequently. I'm also planning to make merchandise other than prints. It might be postcards, (comic) books in a limited edition or something else. I'm still working on that. If this sounds interesting to you, please check my webshop once in a while. But why don't have a peek at my shop right now? You might find something currently for sale which is already much to your liking. 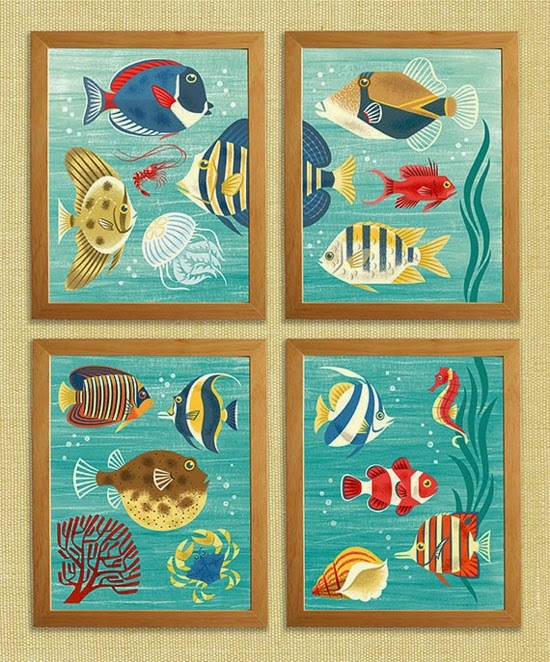 A little while ago I was asked to make a decorative wall piece for a living room. My principal gave me a free hand in whatever I would like to choose as a subject for this work; a rare opportunity! I have always been fascinated by the deep sea and its inhabitants. 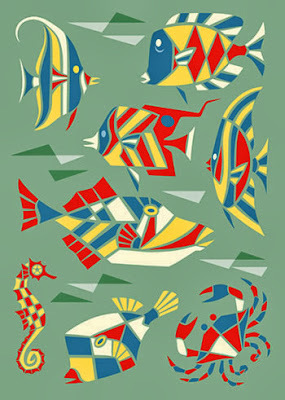 I'm also very fond of mid-century modern decorative art, often applied as murals. I figured it would be a nice idea to combine those two, so I decided to make a depiction of a giant squid using a visual imagery in the spirit of the mid-century modern artists. The two tentacles of the squid are still a little too short to my liking, so I make them a bit longer. 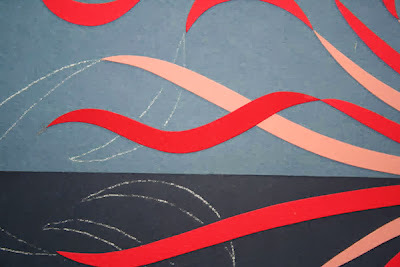 Having made this adjustment, I have to enlarge the sketch, because I'll need a working drawing the same size as the actual paper collage, which will be 65 cm wide and 19 cm high (ca. 25,6" x 7,5"). This working drawing will come in very handy whilst constructing the collage, but first I'll have to make the background. 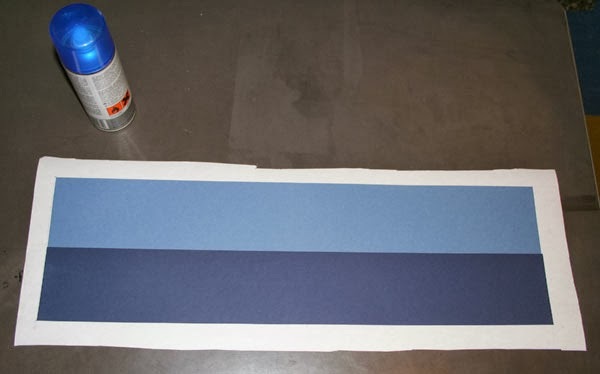 This background consists of two strokes of paper in two shades of blue. 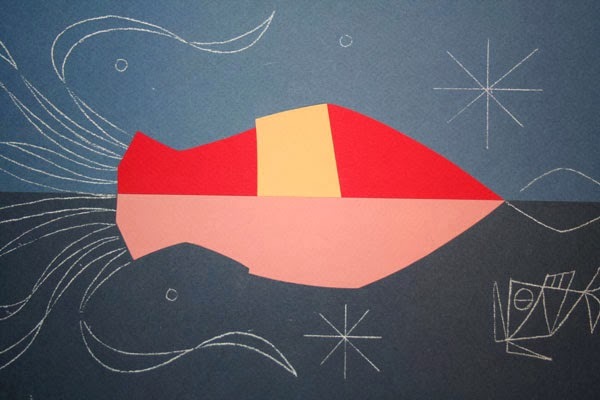 With the use of the working drawing and transfer paper I trace my design onto the background. These chalk lines will help me to paste the cut-out pieces of coloured paper onto their right position. 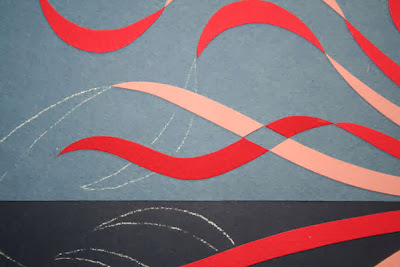 Using the working drawing as a template, the various shaped segments of the design are traced onto different colours of paper. I start with the mantle and head of the giant squid. The basis for this consists of two colours. 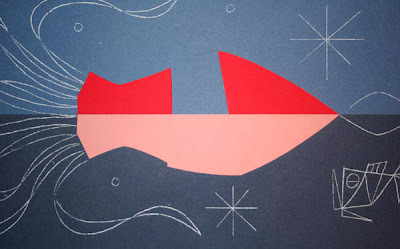 After cutting the traced segments out of the coloured paper, I glue these parts onto the background, but not before I've erased the white chalk lines that mark the contours of the mantle and head on the background. Next step will be adding other colours to the body and head of the squid. 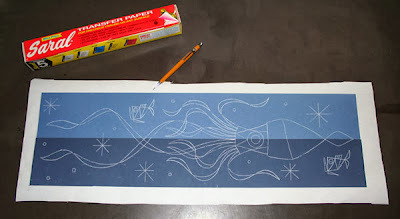 I trace another segment of the design onto a sheet of coloured paper (yellow this time), cut the shape out of the paper and then glue it on the mantle of the squid. I don't want too many layers of paper on top of each other. So I use the piece of paper I've just added temporarily as a mould to cut exactly the right shape out of the body of the squid. I use spray mount as an adhesive. 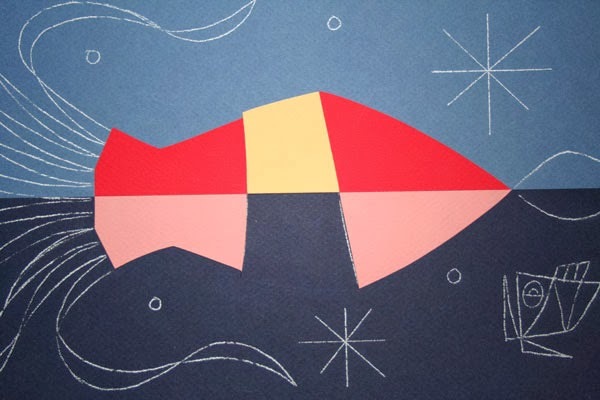 That way already pasted segments of paper can be quite easily removed and - if necessary - be repositioned. 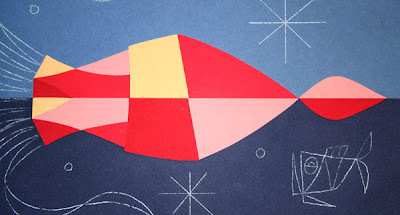 Having removed the piece of yellow paper and the underlying red paper which I've just cut out, I replace the yellow segment which now perfectly fits into the vacant spot. Following the same procedure, I apply another segment onto the lower part of the mantle. ..... and so on. Bit by bit the segments are positioned in place. I've also added the tail fin of the squid. The eye of the giant squid is assembled with (semi)circles. It's almost impossible to cut out a perfect circle out of paper by hand. Therefore I prefer to use a circle cutter. However, a disadvantage of working with a paper cutter like the one pictured below, is that you'll get a small hole in the middle of the circle, similar as to when using a pair of compasses. This hole causes no difficulties as far as it concerns the eyeball itself (or sclera, using the correct scientific denomination), as the pupil will be placed on top of the sclera, covering the hole in the centre. Assembling the pupil is a little bit more complicated. The pupil is constructed of two semicircles. 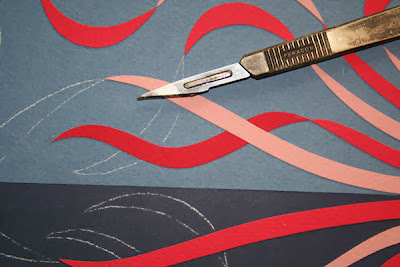 Making these semicircles with the use of the circle cutter, the hole which is made by this cutter is still partly visible, even though the circles are cut in half. Therefore I cut off a tiny little slip of paper from the part of the semicircles where the hole is situated. With the hole being cut away along with the little slips of paper, I put together the two semicircles to make one whole circle. Of course this will not be a perfect circle, but that will be hardly visible. Now that the head and mantle of the squid are completed, I can start with the arms and tentacles. It's not a very complicated piece of work, but it needs to be done with a lot of accuracy. It's essential to keep focused doing this kind of work, because with all these segments of paper a mistake is easily made. It may not be complicated, but it's nevertheless a rather time consuming job to do. 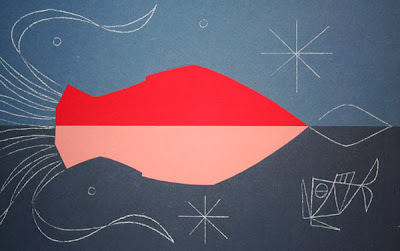 I want to create a flat image. Therefore I want an empty space where the arms or tentacles of the squid cross each other, in order to take away every suggestion of depth. I guess that this vague circumscription may need a more detailed explanation. The three pictures below will probably clarify my intention much better. The last step will be cutting away a little piece of the pink segment, leaving an empty space where the two segments cross each other. 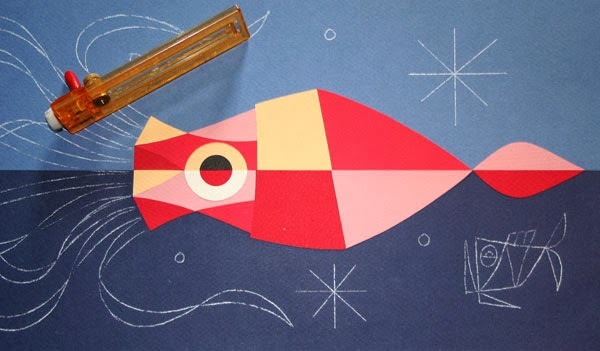 The result of all this cutting is that neither the red or the pink segment of the squid's arms is in front (or behind for that matter) of the other one, thus taking away any illusion of depth. Besides that, it gives a nice visual effect, which is not an insignificant detail in a decorative work of art. 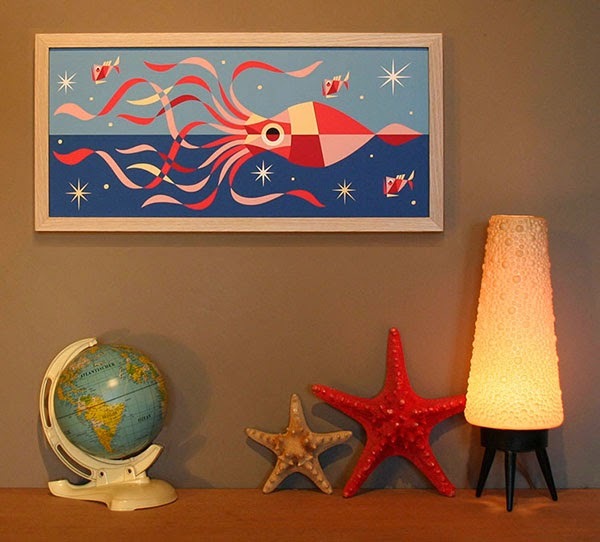 With the giant squid all finished, the paper collage is going ahead quite well! However, all work is not done yet. I still have to construct the two deep sea fish. This is done in the same fashion as the squid's mantle and head, so an elaborate verbal manual will be somewhat redundant. A visual guideline will be quite sufficient in this case. Last thing to do is add some dingbats for the finishing touch. After eighteen hours of work the paper collage is finally ready! Although all work is done, the collage still needs to framed. As it's not a standard size, the frame has to be made to measure. A fine job for the frame-maker, I should say.